"The most eagerly awaited event of the (Easter) season was the performance on Holy Saturday. Fifteen- and sixteen-year old boys, after weeks of rehearsing, came running into the church with a roar, bearing dead crows lashed to poles. Devout old women, exhausted by a strict observance of the fast and by endless prayer, their heads drooping lower and lower, were suddenly roused from their drowsy meditations by a dead crow dangled before their noses." Crows again. and later in the book, they appear, walking on the ice floes, as one of the first signs of spring. "Six months after the wedding, a baby son was born to Romuald and Barbarka. The thawing fields already bulged with naked black hummocks when an early April freeze forced them to take the sleigh to church. The baby was christened Witold. The sky was cloudy, crows cawed in the sallows, and Romuald's red-tasseled parade whip lazily flicked the horse's spine." Well, it seems pretty clear that crows are associated with female fertility in the recollections of Czeslaw Milosz. Crows are associated with Devi in India. I'm discovering a new vision of the historical Jesus through Bruce Chilton's "Mary Magdalene." I have a friend who has had for many years a mighty fascination with Mary Magdalene, not as prostitute or consort, but as 'friend of the Lord,' and teaching companion. Well, what we know about the early disciples of Christ is next to nothing by today's standards of knowledge, and everything that has been written in the past is pure speculation. This book is also speculation, but it is educated speculation, and what I would call 'historical reconstruction' - something like those reality shows on PBS, where people try out life on a ranch or an early American colony. These reconstructions are based in historical documents we do have: lading slips, diaries, and supplemented by what people experience today when they try on 'period-life' like a costume. The new historical research into the life of Christ and early christianity is a complex reconstruction of storytelling-styles and traditions, coupled with snippets found in letters, alternative gospels, written homilies, and other traces of information that have been painstakingly collected and analyzed over the past hundred and fifty years or so of 'historical criticism.' Well, it turns out my friend was probably right about MM being a teaching companion of Jesus, something I certainly never encountered in my early religious education as a Roman Catholic, ie the Petrine tradition, which from the start was opposed to the Magdalene tradition. This is from my christian phase in my mid to late twenties. The 'hair-rays' are stylized, compared to what I actually saw in my internal vision, which was a much more serpentine, moving, buzzing-with-energy sort of thing. What I was experiencing was a sort of prayer-dance. 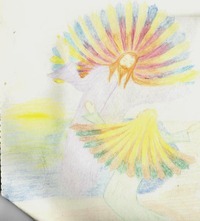 But I did my best to capture my experience using colored pencils and a primitive un-developed drawing ability. Sigh. Something I find interesting about this piece is that Jesus, although levitating, appears over a lake with the sun in the background. I almost always visualized Christ, whether intentionally or unintentionally, in a natural setting. He is a sort of nature-god to me. I've been noticing in my re-reading of the medieval mystics that much of what they say mirrors the old pagan hymns. For example, Julian of Norwich writes, "In this first revelation of our Lord I saw in my understanding six things. The first is the tokens of his blessed Passion, and the plentiful shedding of his precious blood. The second is the virgin who is his beloved mother. The third is the blessed divinity, that always was and is and ever shall be, almighty, all wisdom and all love. The fourth is everything which he has made; it is great and lovely and good." She goes on to write that the fifth and sixth things are that God has made everything from Love, and that God is everything that is good. These first four things are exactly the same as the things held sacred in the old pagan systems, such as romuva: 1) blood and/or the color red, 2) the goddess/virgin/ lady, 3) 'divinity': light and wisdom, and 4) creation, the natural world. Having this realization helps me to read these mystics very differently and helpfully. I'm sure there must be others who are already reading the mystics this way, but for me, it is a 'revelation,' my one private 'showing,' just as that prayer-experience which I 'drew' above was something unique in my experience at the time, something I had not 'heard of,' and felt secretive about for a long time. I finally showed it to one of my theology professors, along with this quote (2 Cor 3:18), which was for me the meaning of this image at the time: "And we all with unveiled faces, beholding the glory of the Lord, are being changed into his likeness, from one degree of glory to another; for this comes from the Lord, who is the Spirit."